The Department of Energy is a criminal organization. No doubt about it. I can't remember the last time I sent out the wrong version of something, but yesterday's newsletter was supposed to look like what you see below. It's a bit "enhanced" and cleaned up, but otherwise pretty similar. Long-time readers might enjoy seeing how an article evolves? In any case, my apologies for any confusion! The Department of Energy (DOE) is committing treason. Has been for years. They are playing with Americans' minds by forcing us to accept nuclear waste in our midst. From Atoms for Peace and Too Cheap To Meter, it's been a litany of lies handed down from the AEC and carried on to this day. Nuclear power is not green. It can't solve global warming or anything else. Mere trillionths of the total production of nuclear fission reactions is of any use as medical or industrial tracers or cancer-zappers. DOE has usurped our rights as citizens. They are creating weapons of mass destruction that remain in our midst forever. The DOE is targeting U.S. citizens with these weapons. The DOE is a criminal organization. They are playing a high-stakes game with Russia which, if it results in just 1% of the nuclear arsenal of each country being used, would effectively permanently destroy both countries. Several other countries are involved in this high-stakes game (China, Britain, France, etc..) but America and Russia are the bully players. The cost of the "game"? Obama plans to put another trillion dollars into it. And he's the "peace" president! In two years, who knows what a Republican might spend? Two trillion? Three? And to think that it's spent under the name of "stewardship"! Keeping the weapons cache safe. Keeping it current. Senseless because we then had to send our own troops into harm's way -- into Hiroshima and Nagasaki to help with the clean-up. One survivor of that operation told me he had had close to 200 skin operations on his face, starting soon afterwards. 200 sets of stitches, how's that sound? Because the American soldiers sent to Hiroshima and Nagasaki weren't given ANY protective equipment -- not even gloves or face-masks, the bare minimum for cleaning up after a radioactive contamination. The Department of Energy demands that we keep the nuclear waste at closed reactor sites like San Onofre for what will surely be decades and may be centuries in the best of cases, and an eternity in the worst of cases, because if there is an accident, it will be virtually impossible to clean up, so the area will be damaged virtually forever. Areas around Chernobyl and Fukushima are not going to be open to human habitation for longer than the pyramids have stood -- and even then, it will be because the poisons, active down to the last atom, have spread out amongst the rest of the biosphere to kill, maim, disfigure and deform there as well. Plutonium has a half-life of about 24,000 years. DOE is committing treason by demanding that each nuclear reactor site keep the waste created there onsite for at least 60 to 300 years (maybe longer), which is also by far the most dangerous time: The waste is extremely hot, both thermally and radioactively. For thousands of years, spent nuclear fuel is fully capable of having just as horrific an accident as Chernobyl or Fukushima -- and even far worse (all four of those meltdowns could have been far worse). And yet the next few centuries are the most hazardous by many orders of magnitude, because of the fission products which are more rapidly decaying, and some of which, the body takes up as if it were a nutrient or a normal water atom. During this most-hazardous time, they want to keep it stored amongst millions of people. These are some of the many dirty secrets of the nuclear industry. That there never will be a good spent fuel plan is one of their most obvious dirty secrets: Containment structures are made of atoms and molecules, in crystal lattices or in various sheets of substances in alloys. Radiation smashes through all that stuff, and rearranges molecules, energizes atoms to move around in an alloy, and so forth. Ionizing radiation can break any normal chemical bond -- any at all -- and thus, can destroy any container you put it in. So long-term safe containment truly is impossible, hence the choice several countries have made and America is threatening to try: Bury it and try to forget about it. America so far has been smart enough to reject that option: But now what? Southern California Edison wants Californians to settle for what is typically used around the country as "temporary" on-site dry cask storage: 5/8th inch thick stainless steel canisters as big as a truck, holding up to 32 fuel assemblies as tight as sardines. Weld them shut, set them out in a comparatively thin (3 to 5 feet thick) cement sarcophagus, and hope nothing goes wrong. There are more than 2,000 such canisters in America, just waiting for a little moisture to get in through an unnoticed crack and cause an explosion, or for an airplane to crash into a row of them, or for an earthquake to swallow one and crush it, or just shake it apart, or for a 41-foot tsunami to overwhelm them when they are only rated to survive submersion up to 40 feet -- and that's if a boat doesn't happen to sit on top of them as the tsunami washes back out. Accidents will happen. They happen all the time, and it's just a matter of time until some area of America is destroyed just like Chernobyl and Fukushima were, and our "waste confidence" (as the NRC calls the current lack of a plan for the spent nuclear fuel) drops down to where it belongs: NONE. The DOE is forcing innocent Americans to risk nuclear catastrophes, mostly without their knowledge, and certainly without their consent., but that's exactly what the DOE is doing. Other countries are just as stupid, but that's no excuse. China's nuclear power construction projects are slathered in graft and kickbacks. South Korea's are too. All of Japan's reactors have been shut down since Fukushima because the regulators (and the people) realized they weren't built strong enough to begin with. America has 23 similar reactors which cannot be made safe, and should be permanently shut down (as should all the others). Areva, the French-government's nuclear parts manufacturer to the world, and the maker of many of the dry casks in America as well as in Europe, is awash with scandal, as usual. England has its ongoing scandal and clean-up mess at Sellafield. And on and on and on. Note: This communication may have been intercepted in secret, without permission, and in violation of our right to privacy by the National Security Agency or some other agency or private contractor. The Department of Energy (DOE) is committing treason. They are playing with American's minds by forcing us to accept nuclear waste in our midst. They are usurping our rights as citizens, they are appropriating weapons of mass destruction, and they are targeting US with those weapons. The DOE is a criminal organization. No doubt about it. But nuclear weapons are useless. In nearly 3/4s of a century we've never found a use for them, not since the first two senseless attacks on Japan (senseless because Japan was already practically beaten, senseless because they did not attack soldiers, they attacked civilians (including some American POWs), senseless because they did not consider the real consequences of the radiation, believing that any too-high doses would blow away in the wind, or that anyone close enough to be harmed by the gamma radiation would be killed by falling bricks and other debris and pressure waves anyway (but not first, I might note), senseless because Japan could have been shown the power of the bombs without bombing dense concentrations of civilians (but I guess that was the point of the strategists's ruse: to pretend that EVERY city in Japan would soon suffer the same fate, and it worked. In reality, of course, the biggest secret about The Bomb was that we had used up the entire arsenal with the three explosions (Trinity, Hiroshima, and Nagasaki) and if the war had continued, it would have surely been over before we could use atomic weapons again). Senseless because we then had to send our own troops into harm's way -- into Hiroshima and Nagasaki to help with the clean-up. One survivor of that operation told me had had close to 200 skin operations on his face, starting soon afterwards. 200 sets of stitches, how's that sound? Because they weren't given ANY protective equipment. Not gloves or face-masks, the bare minimum for cleaning up after a radioactive contamination. The DOE demands that we keep the nuclear waste here for what may be eternity, because if there is an accident, it will be virtually impossible to clean up. Areas around Chernobyl and Fukushima are not going to be open to human habitation for tens of thousands of years -- and only then because the poisons, active down to the last atom, have spread out amongst the rest of the biosphere to kill, maim, disfigure and deform there as well. By demanding that each nuclear reactor site keep the waste created there for at least 60 to 300 years (maybe longer), which is also by far the most dangerous time: The waste is extremely hot, both thermally and radioactively. For thousands of years, spent nuclear fuel is fully capable of having just as horrific an accident as Chernobyl or Fukushima -- and even far worse (all four of those meltdowns could have been far worse). 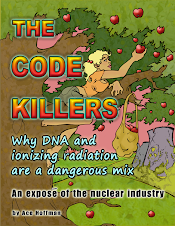 These are the dirty secrets of the nuclear industry. That there never will be a good spent fuel plan, that the local reactors are to keep the waste after the plant has closed, and that ACCIDENTS WILL HAPPEN. They happen all the time, and it's just a matter of time until some area of America is destroyed, just like Chernobyl and Fukushima was, and our "waste confidence" (as the NRC calls the current lack of a plan for the spent nuclear fuel) drops down to where it belongs: NONE. Forcing nuclear accidents on innocent Americans is treason, but that's exactly what the DOE is doing.